After his outdoor season in 2009 was washed away by a freak injury, VU alum and assistant coach Adrian Blincoe is interviewed here after his 3:58 indoor mile at the New Balance Games on January 23. As a Kiwi, Blincoe will participate in the 2010 Commonwealth Games, to be held this October in India. He's trying to regain his 13:10 5000 meter form incrementally and his sub-4:00 indoors at New Balance constitutes his 2010 debut. 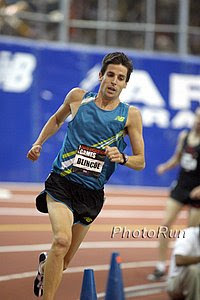 Blincoe is the New Zealand national record holder at 5000 meters. Among Villanovans, only Sydney Maree has run a faster 5000 meters.